"Both sexes paint their Bodys, Tattow, as it is called in their Language. This is done by inlaying the Colour of Black under their skins, in such a manner as to be indelible." Many of Cook’s men returned to England with tattoos they’d received on their voyages and the practice quickly became a tradition, hence the enduring association with sailors and men of the sea. It might have been common to see crudely inked bodies in the eighteenth century docks and taverns of London and Liverpool, but otherwise tattoos were stigmatised, associated with criminals and prostitution. No respectable woman would have displayed one. This began to change in the latter half of the nineteenth century when tattoos became fashionable among the upper classes. Notable society figures, including European royals, acquired tattoos, creating something of a fad that wasn’t confined to men. One magazine of 1898 estimated that a fifth of British landed gentry had tattoos, while the New York Times claimed that many society women had designs in ‘inaccessible places’. Famous beauty, Lady Randolph Churchill (Winston’s mother) was said to sport a serpent wrist tattoo that she covered with bracelets, and some have even suggested that Queen Victoria herself succumbed to the craze. This cover of the Police Gazette from 1870 shows a well-heeled woman receiving a tattoo in her boudoir – more than a hint of titillation about it. A tattoo might have been a provocative fashion statement for some women, but mostly they were not to be shown in public; they were private and rarely visible. Meanwhile, on the other side of the pond, a few women found fame and fortune exhibiting their ink in the circuses and freak shows of America. 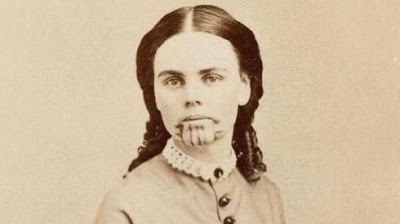 Tattooed native women had been displayed as circus freaks in America for years, but the earliest known tattooed white woman was Olive Oatman. Her story is a sad one. In the 1850s, during an ill-fated journey to California, Yavapai Indians attacked her family. Only Olive and her sister survived. The girls were rescued and adopted by Mohave Indians, who gave Olive a traditional facial tattoo. Her sister died but Olive lived with the Mohave until she was ransomed some years later. She soon became a celebrity, touring the country giving lectures about her experiences. People flocked to see the facial markings that, according to Olive, were inflicted without her consent. More recent research suggests her stories may not have been entirely truthful and the tattoo was a sign of willing acceptance among her new Native American family. Later she married, turning her back on her extraordinary past, abandoning the lecture circuit and using veils and make-up to cover the evidence of her time with the Mohave. 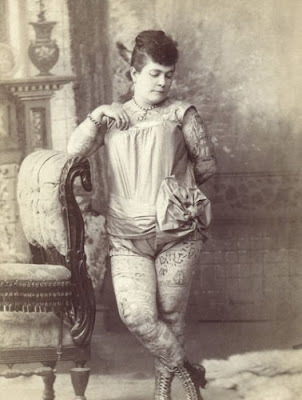 Others played on Oatman’s story, and many of the ‘tattooed ladies’ who began performing as circus attractions in the latter half of the nineteenth century claimed to have been captured and forcibly tattooed by native tribes. One of the best known is Nora Hildebrandt, America’s first professional tattooed lady, who toured with Barnum and Bailey’s circus throughout the 1890’s. Nora claimed to have been held captive for a full year, tortured daily with hours under the needle. She even suggested that the famous chief, Sitting Bull, had been involved. 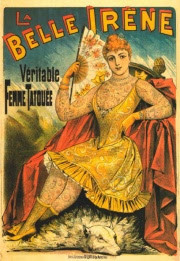 It soon became evident that this fabricated history, while entertaining, was hardly true: Nora is commonly said to have been the daughter, or wife, of Martin Hildebrandt, an artist who opened the first tattoo parlour in New York City (possibly as early as the 1850s) and was heavily in demand among American Civil War soldiers. But this too is doubtful. Nora was actually born in England and there’s no proof she was either married to or related to Martin. (He’s recorded as married to a woman called Mary, with one son – Frank). Perhaps she took his name in acknowledgement of the art with which he covered her body, but the reasons are lost in almost as much myth and hearsay as Nora’s own stories. Even so, some of these women became stars. 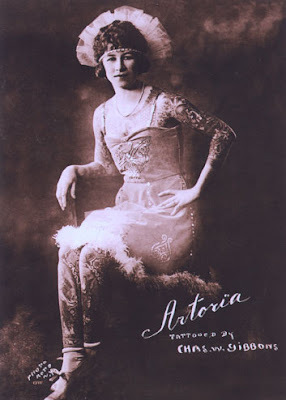 Artoria Gibbons was the highest paid tattooed lady of the 1920s, with a legion of fans, and others, such as Betty Broadbent, went on working as pin-ups and performers right up until the 1960s. It certainly offered a level of fame and financial independence, more so once women became more than just a canvass. One of the most enduring, evocative images of early tattooed women is that of Maud Wagner (née Stevens); widely regarded as the first American female tattoo artist. At the beginning of the twentieth century, Maud was a circus performer, making a living as an acrobat and contortionist – hardly a conventional career choice to begin with. While entertaining visitors at the St Louis World Fair she met Gus Wagner, a renowned tattoo artist (and the last to work with old-fashioned needle and ink, rather than a machine). Legend has it that Maud agreed to go on a date with Gus only if he gave her lessons. She learned the art from him, going on to become a circus attraction and respected tattoo artist in her own right. They ran a successful business together and their daughter, Lovetta, continued the tradition, becoming a well-known artist, working up until the 1980s, despite apparently never getting inked herself. I’d love to know how many of Maud’s clients were women. Margot Mifflin’s book, mentioned above, is one of several that chart the history of tattooing in relation to the female body, the changes in gender prejudices and stigma over the years and the reasons for them. It’s a complicated history that’s synonymous with women’s rights, feminism and the changing representation of women’s bodies. 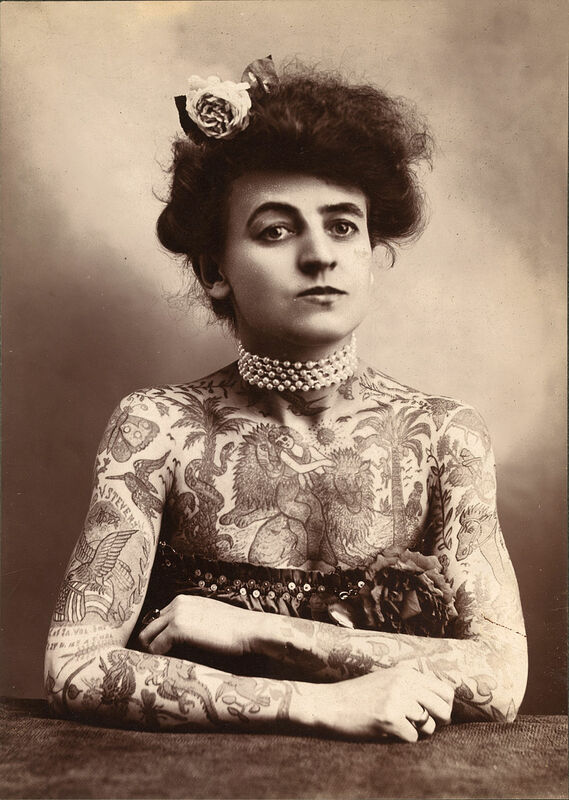 I wonder what these tattooed ladies of a century ago would have made of the proliferation of body art that adorns all kinds of women – and men – today. Would they see themselves as pioneers? Even if some of them were motivated by money, renown or simply a passion for the art, they certainly broke the rules, and in doing so, made a statement which was far more subversive – and gutsy – than it is today.